This week we move to early Renaissance Burgundy, Italy, and France withe recordings by Asteria, the Nelson/Bartram Duo, and Mignarda. I. 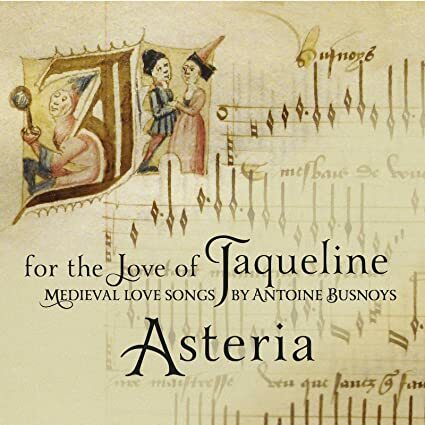 For the Love of Jacqueline: Medieval Love Songs by Antoine Busnoys. (Asteria). Asteria Music CD AMCD0412. --Cest vous en qui jay esperance ("It is in you whom I have faith"). --Joie me fuit ("Joy flees me and pain follows me surely"). --Le corps sen va ("The body departs, and the heart remains with you"). II. SFUMATO: Musica per voce e liuto del Rinascimento Italiano. (Mignarda) Mignarda CD 008. --BARTOLOMEO TROMBONCINO (c.1470-1535): Poi che volse la mia stella ("Since my fortune changed and I saw the loveliness of a little mountain maid"). --TROMBONCINO: Vergina bella ("Virgin fair, arrayed in the sun"). --SEBASTIANO FESTA (c.1490-1524): O passi sparsi ("O scattered steps, O yearning, ready thoughts"). --PHILIPPE VERDELOT (c.1480-1530): Quando Amor i begli occhi ("When Love bends her lovely eyes to the ground"). --VERDELOT: Con lagrime et sospir ("With tears and sighs, saying no"). --LUCA MARENZIO (1553-1599): Pingo che Amor ("I cry, because love with the unaccustomed outrage of a new flame, burns and consumes my heart"). III. 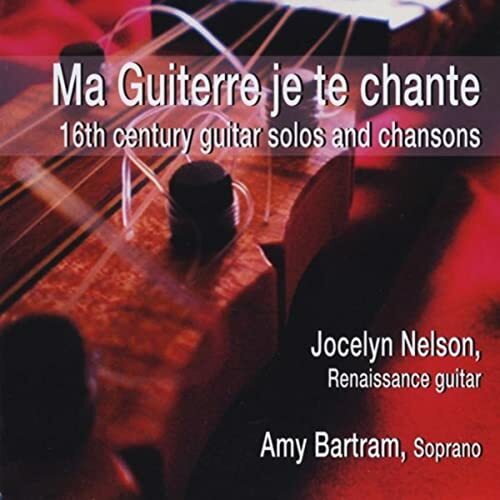 Ma Guiterre je te chante: 16th century guitar solos and chansons (Jocelyn Nelson, Renaissance guitar/Amy Bartram, soprano). --JACQUES ARCADELT (c.1507-1568): Si ce n'est amour qu'est-ce ("If it isn't love, what is it, what is it that I feel?"). --ADRIAN LE ROY (c.1520-1598) arranger and publisher: Prélude; Il estoit une fillette (basse danse); Tourdion. --LAURENT BONARD (fl.1547-1554): Au jour au jour au jour (In the daytime, at the pretty daybreak, there was a woman"). --LE ROY: Bransle gay la centure; Bransle gay. --ARCADELT: Margot labourez les vignes ("Margot, you toil in the vineyards"). --CLAUDIN de SERMISY (c.1490-1562): Tant que vivray ("When I am still in my prime, I will serve L<ove").